The Red Devil Cichlid is a charismatic creature. It makes for an excellent display for any fish tank. It is large in size and can reach up to 15 inches (38 cm). It is ferocious in nature and is considered the most aggressive among cichlids. The large size and charismatic nature make this creature quite the exhibit for any aquarium enthusiast. These fish are usually not consistent in terms of body type and colour. They have a variety of colours that usually help them blend in with their surroundings. Their lips are thick and can be orange or black. They could have red, white or yellow body colour. Some might boast a black tip fin or black tip tail as well. 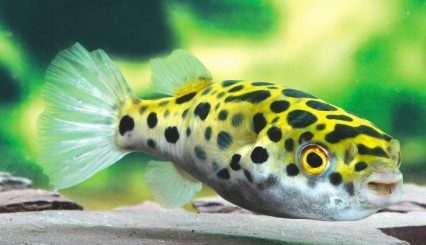 In the wild, this fish usually has a brown or grey body colour. 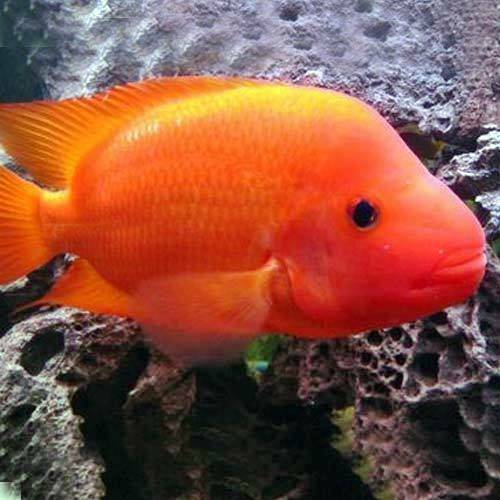 The Red Devil Cichlid is an apt name for this fish not only because of its extremely aggressive nature but also because of its body’s makeup. It has a strong set of teeth along with a powerful jaw. It has an intimidating aura that demands the respect of other fish. It is said to be extremely conscious of its surrounding and forms a strong bond with its owners. It exhibits traits which are almost doglike as it follows its owners around the room and tries to ask for food when hungry. It responds to interactions and performs playful activities such as showing its speed and colours. This particular species of fish was first discovered in 1864 by Gunther. It is found in lakes near Managua and Nicaragua in Central America. It mostly occupies spaces near the Atlantic slopes. It is not listed in the IUCN list. It was previously classified as Cichlasomalabiatum until 1980. This classification was later changed to their current scientific name of Amphilophuslabiatus. This was done because it no longer fits into its previous genus. The current category consists of 12 species. 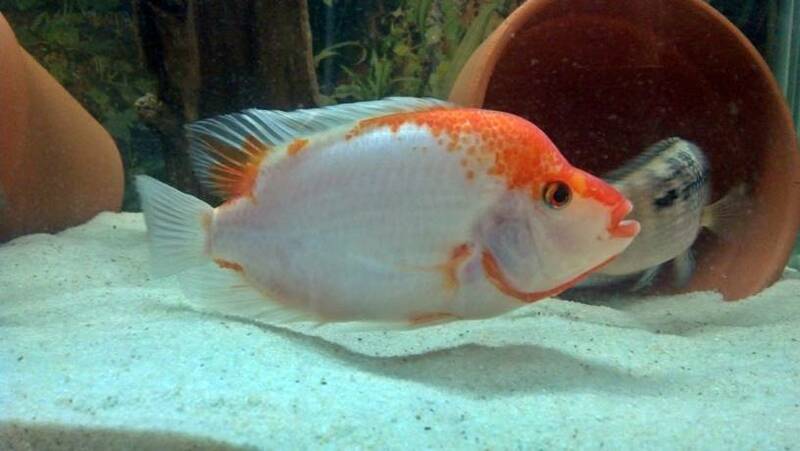 Red Devil cichlids are not commonly found in rivers presumably because of their unstable nature. They can be found in open waters such as lakes. The lakes which they reside in are often populated by bull sharks. This is why these fish usually reside in places that consist of rocks and other obstacles. These obstacles provide a natural hiding point for the Red Devil Cichlids against bull sharks, making their survival possible. They usually eat small organisms and fish. Their diet in the wild consists of insects, small fish, snails and worms. They are classified as solitary because they are not particularly social in nature. Caring for a Red Devil Cichlid requires insight into its habits and nature. It is hard to manage due to a variety of reasons and, therefore, requires experience. It is not recommended for a beginner fish aquarist. This species of fish can reach up to 15 inches and takes around 3 years to attain its maximum size. It is large and stocky with pointed fins. It matures sexually and spawns at 6 inches. It can live around 10 to 12 years, depending on the amount of care provided by the owner. It can have a variety of different colours. The wild Red Devil Cichlids may have a predominantly brown or grey colour, which helps them blend into their surroundings. In captivity, however, they exist in various colours such as red, yellow and white. The thick lips usually decrease in size in captivity for reasons that are still not evident. Even in captivity, the lips maintain the colour black or orange. 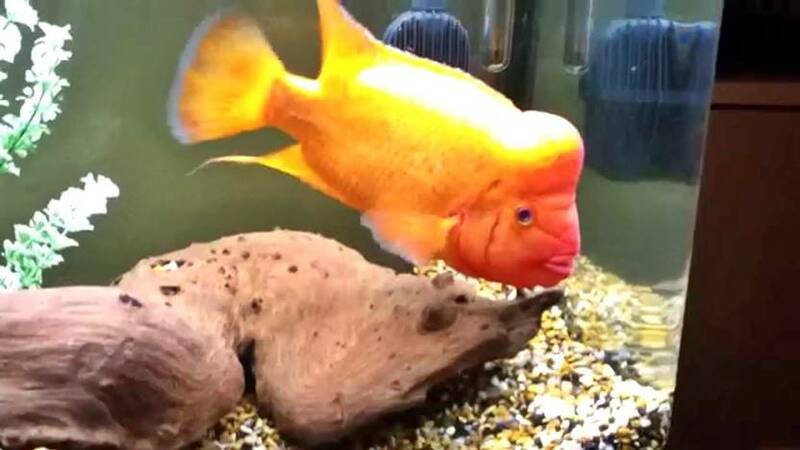 This fish is eager to eat, and the owner would not have much trouble feeding it. It can eat almost anything offered by the owner. It can exist in a variety of water conditions that aren’t extreme. It is, however, extremely aggressive. Due to its large size, it requires an equally big tank to survive. It is not very tolerant of any other fish in the same tank. 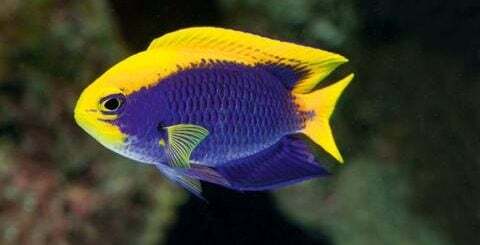 Unless it is with a mate, this fish cannot survive with another fish in the same tank due to its highly aggressive nature. 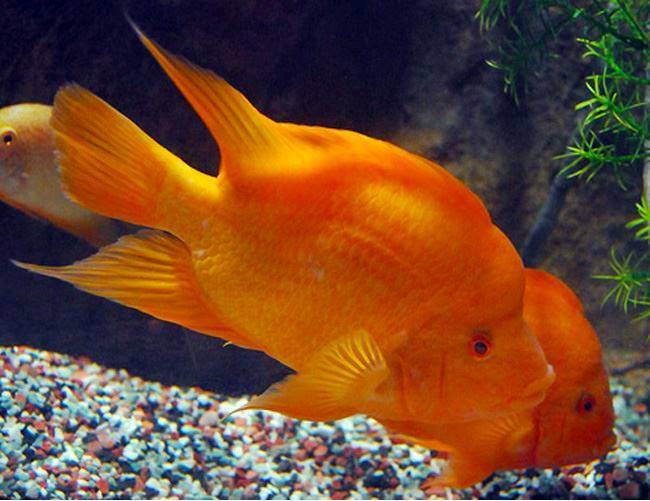 The Red Devil Cichlid eats most foods and falls under the category of an omnivore. It can be fed various types of living, flake and fresh foods. The fish needs to be fed several times a day. A balanced diet is required to take care of this fish, and it is recommended it be fed high-quality pellets and flake food every day. It is often confused as carnivores because of its aggressive nature of attacking and eating other fish. The owner has to be careful feeding the cichlid meats such as beef and chicken because they contain various fats and proteins that can be detrimental to the cichlid’s health. They could cause various problems such as a blockage in the digestive tract and organ trouble. These can act as an occasional meal if the fish enjoys them. Making them part of the regular meal plan is not recommended. The Red Devil Cichlid has been a subject of extensive breeding. The male is usually larger than the female and has a pointed genital papilla. The female’s genital is blunt. 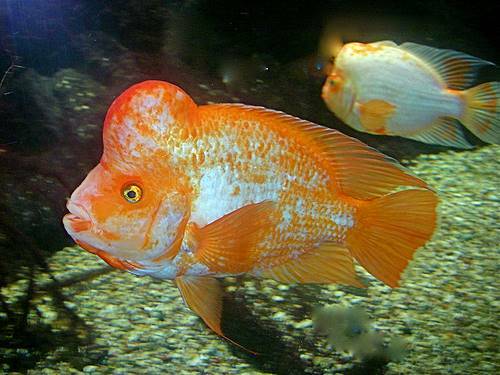 The Red Devil Cichlid comes under the category of the open spawner. It usually starts a patriarch-matriarch family and prefers to spawn on inclined substrates. The female takes care of the offspring initially. It can lay around 650 eggs. These eggs are transparent and possess a yellow tinge. The total time for an egg to hatch is usually around 3 days. A temperature of 25 degree Celsius is ideal for the eggs. It takes a newly hatched cichlid around 6 days to swim by itself. Artemia nauplii provide the young cichlids with nourishment. The difficulty of breeding cichlids is considered moderate. After around 3 weeks, the offspring start grazing their parent’s skin for additional nutrients. A permanent nuchal hump is formed in male cichlids in captivity, though in the wild, these humps appear in male cichlids only during the breeding process. As the name itself signifies, this species of cichlids are highly aggressive in nature. It is extremely territorial and attacks other fish in its region. It is usually aggressive to both its own species and others. It is highly recommended that it be kept alone. Growing up is the only time it can be kept with some other predator fish, but the tank needs to be big. A fully grown cichlid, however, cannot coexist with others. The only way to keep cichlids with other fish is to have a very big tank with caves and natural divisions. This creates territories which the cichlid can own so that it will refrain from attacking other fish. 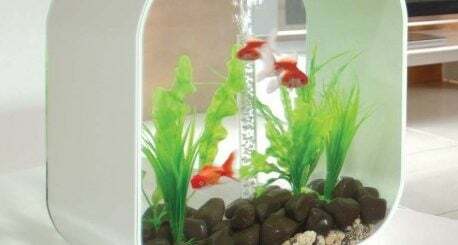 This would also create hiding places for the other fish. Apart from this, there are no other ways to keep cichlids with other fish. Even with a big tank and many hiding places, it is not a guarantee that the Red Devil Cichlid will not attack other fish in the tank. Its compatibility in this way is defined by its aggressive nature. 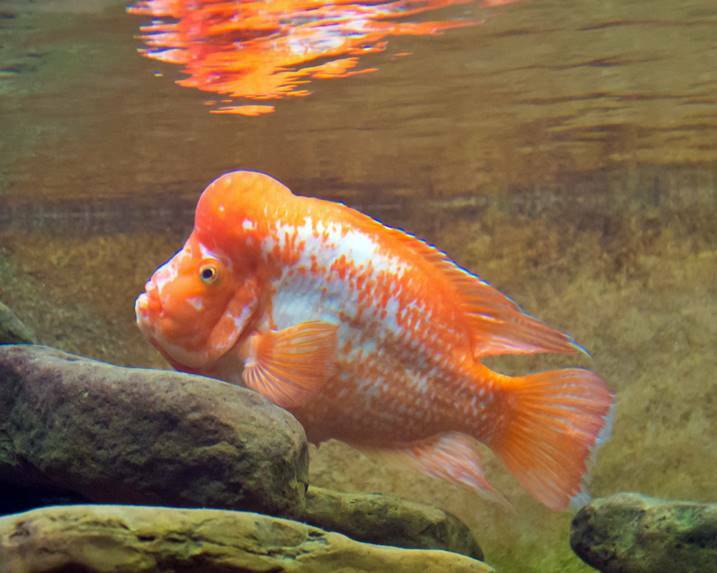 The Red Devil Cichlid can be infected with most of the same diseases as other freshwater fish. It needs clean water and regular oxygenation. 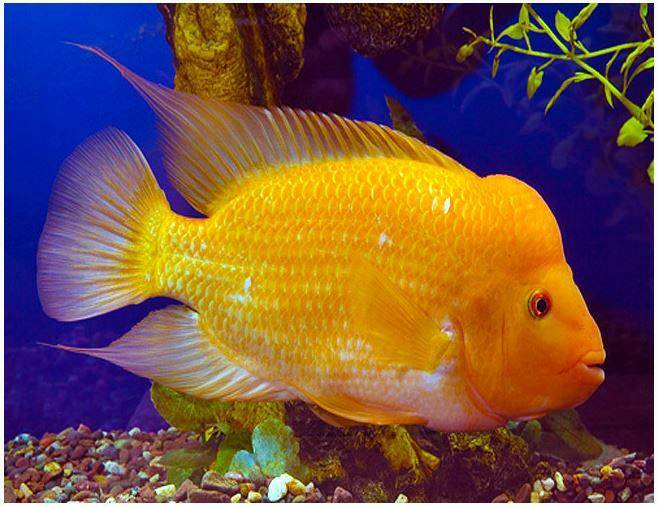 Various diseases can arise if the cichlid is left in the water that is stale or of bad quality. Ich is a common disease among cichlids, which is easily curable. The temperature of the tank needs to be elevated to 30 degrees for around 3 days. Treating the fish with copper can also help cure this disease. Various copper-based medications also exist and can be easily bought. These medications are very effective in treating ich. The copper, however, needs to be applied at an appropriate amount. Another major disease that the cichlid gets is the hole in the head. It is common in larger cichlids that might live in stale or poor-quality water. This disease manifests itself in the form of a hole in either the head or the face. It is usually caused by vitamin deficiency or a lack of other nutrients. Filtration of water can help prevent this disease. Parasitic infestations and skin problems are some other diseases this cichlid could attract. In order to avoid these diseases, a clean tank is absolutely necessary.